A copy of this novel was provided by Bloomsbury Australia in exchange an honest review. This book made me very passionate. For some very not-so-great reasons. 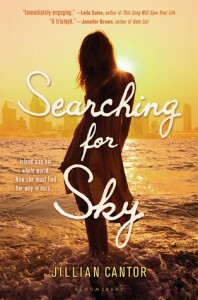 So the main premise of Searching for Sky is that Sky and River have lived on a deserted island their whole life, and then are found my modern day people who bring them to California in order for them to have a ‘normal’ life. I was about 60% or so into this novel and adoring it. I loved Sky’s internal monologue, and I loved her relationship with River, and I loved River (italics needed). The storyline was fantastic. A girl and boy brought to the modern day world. I think this novel has been called a ‘reverse dystopia’. I don’t necessarily agree with that, but it was an interesting view of our world. I knew things were going to go downhill when River says that he doesn’t want to see Sky any more (this happens relatively early on, but in my persistent way I convinced myself that everything was going to turn out all right and they would end up together). Because, really, they have spent every minute of every day together for their entire lives. He isn’t just going to randomly dump her, especially now that they’re in our terrifying world. But like I said, persistence on my behalf and belief in the happily ever after. It was interesting to see how Sky adjusted. Although I think her speech changed a little too quickly to be entirely believable. My favourite part was when the teacher asked her to write her name and she drew a circle. I don’t know why, but I thought it was beautiful. Okay, I really, really do not know how I am going to finish this review without being spoilery as heck. River comes back, and I was all: YES, I was right! But I wasn’t, not really. Because Sky starts to notice that River still talks and acts the way they did on Island (their deserted island). There’s this one scene, and it had me fuming. River goes and gets some strawberries for himself and Sky, and then when Sky eats it she thinks along the lines of: grandmother told me how dangerous it is to eat fruit without washing it first. No. NO. N O. She would not think that! She had only been living in the modern world few a month or so and then she’s suddenly worried about washing fruit before eating it?! *screams* SHE WAS EATING FLOWERS ON ISLAND, FOR CRYING OUT LOUD. FLOWERS. And then she judges River for getting them food to eat, and I just. I couldn’t. The ending. *flips desk* I just. I don’t presume to know what the author was thinking, but it felt like a lazy ending to me. I felt like the ending was only there for “impact”, and that it would be too hard to figure out how to make everything right, so the easy road was taken. It just left me completely unsatisfied with the entire novel. Why? Why make me believe in a story only to just completely write it off a few pages before the end? This is essentially a contemporary novel and contemporaries end openly all the time – so why would that tie need to be made? Why would a chance not be given to the future that could have happened? That’s why contemporaries are open ended! For possibility! And then this awful ending is pretty much this one character’s fault, and if I were Sky I would have been absolutely livid but she gets over it in a few days. *shakes fists* How? How could she have forgiven that character after everything that had happened? It was practically this character’s fault that the ending happened! The character was so blind and stupid and selfish, I actually could not believe it. There was lip curling every time they were on the page (and that was BEFORE the ending). So there you go. I was very passionate about Searching for Sky. It was on its way to nestling itself deep in the heart of my favourites shelf, but no. That ending just had to go and happen, didn’t it?